If you love to hike, would like to explore the mountains around Deer Valley Resort and are staying in town for more than just a couple of days, there are a multitude of ways to get fully acquainted with the area and get you so excited that you’ll want to come back for more. 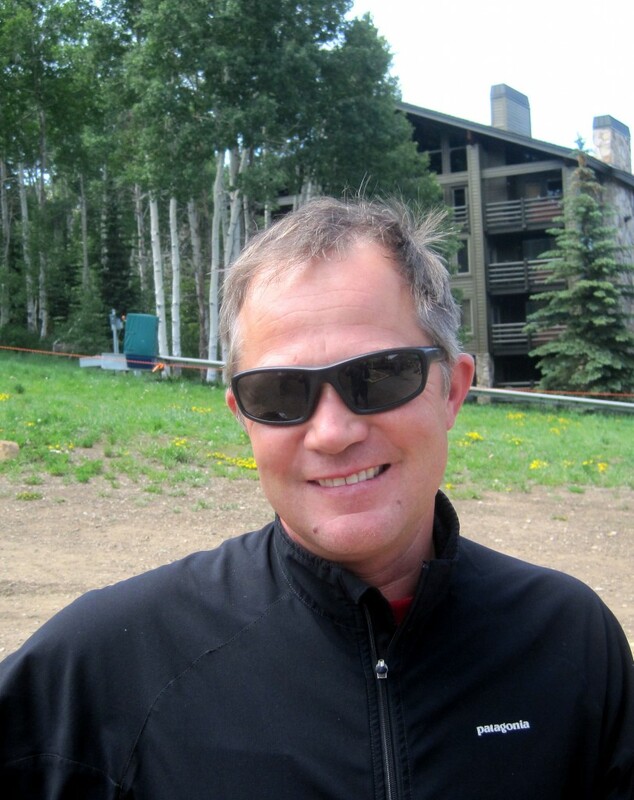 To help sort out some of the best Deer Valley hikes, I spent time with Steve Graff, Deer Valley’s Mountain Bike Manager, brain storming about what kind of graduated mountain hikes could fill an active vacation week. This is an overview of the options we picked for you. A wonderful way to begin is to spend the first day getting acquainted with the weather, the elevation and the terrain. 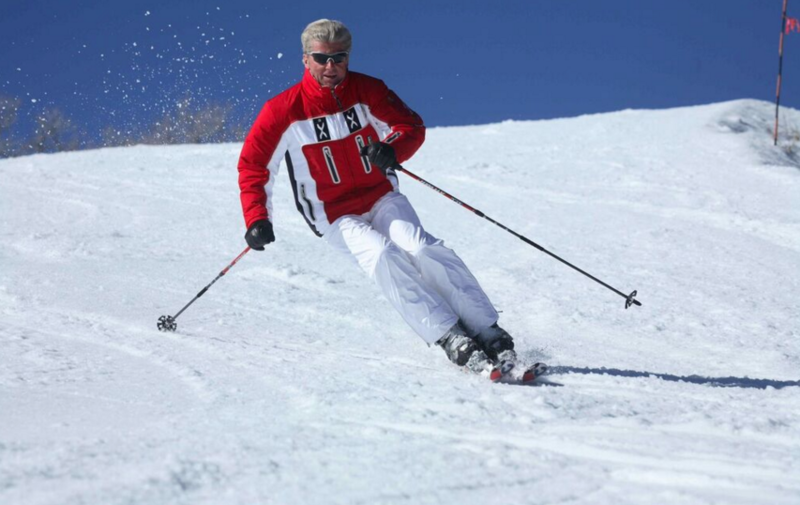 Using the chairlifts on that first day is ideal for minimizing the impact of the altitude. For instance, start at Silver Lake Lodge and begin by riding up Sterling Express and then hike down the Silver Lake Trail. It is a hiking-only trail, so you’ll find only hikers on it. A little over two miles long and dropping 1,300 vertical feet, the trail begins at the top of Bald Mountain at 9,400 feet and meanders all the way down to Silver Lake Village. “Of course, if you are in excellent shape and neither the jet lag nor the altitude seem to bother you, you can do this in reverse by hiking up the Silver Lake Trail,” says Steve Graff. Most people can do it in about an hour depending on their condition. Morning is a great time for this hike. The views are incredible around the east side of Bald Mountain as one sees the Jordanelle Reservoir and, in the distance, the Uinta Mountains… In this high desert climate, mornings are generally very cool. 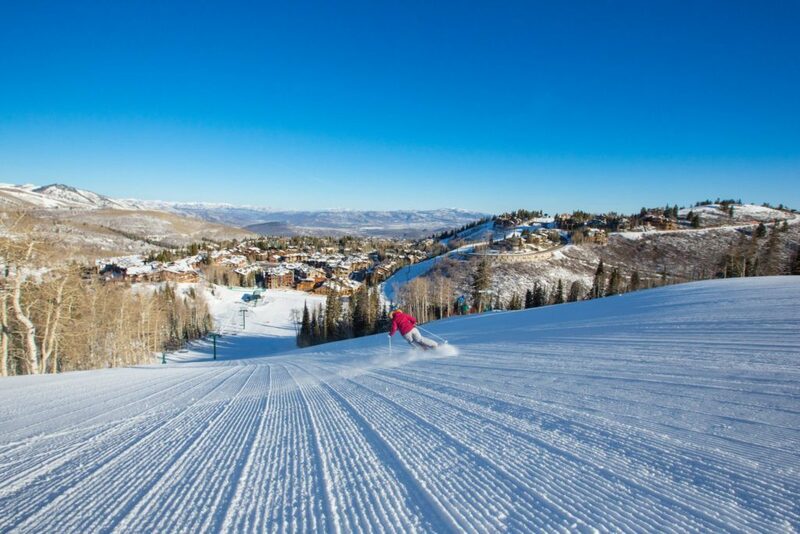 In summer, Deer Valley’s morning temperatures range from the upper 40s to the lower 50s at sunrise, before reaching a daytime high somewhere between 70 and 80 degrees. Crisp, mountain air and beautiful, clear views reward the early morning hiker. So, if you choose to hike early to the top of Bald Mountain and get there any time after 10 a.m., you can ride the chairlift down at no charge. Just make sure to wear a wide-brimmed hat, sunscreen, sunglasses, a light jacket in the event of a sudden storm and always carry more water than you think you’ll need. The third day could be a perfect opportunity to begin hiking from a lower elevation, starting at Snow Park Lodge, and hike up the Deer Crest Trail. This hike is a little over three-miles long, all the way to Silver Lake Village. It is also a multi-use trail, where both hikers and bikers are allowed. The rules of the trails are that bikers yield to hikers. This said, if you notice bikers coming your way and can afford to step off the trail, let them pass; this is a gesture that is always appreciated. A smile and a greeting also go a long way; in short, by just being respectful of each other, all trail users can co-exist very well. The Deer Crest Trail offers yet another set of great views all the way up. 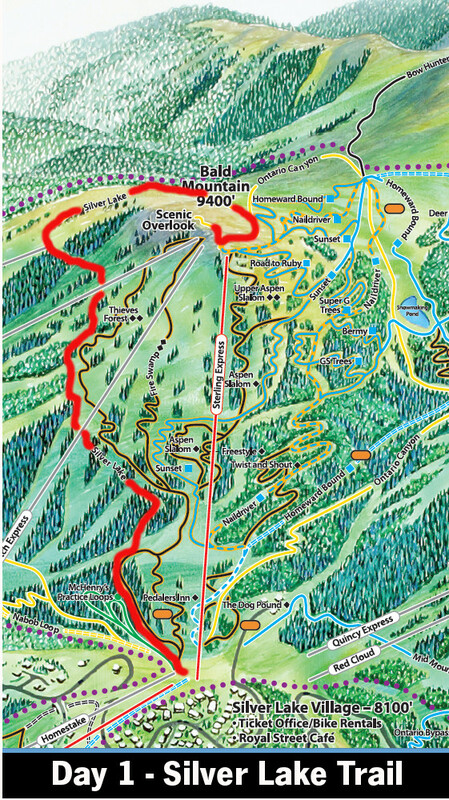 Instead of just stopping when reaching Silver Lake Village, continue on to the Mid Mountain Trail and catch Red Cloud Trail up to the top of Flagstaff Mountain at 9,100 feet. 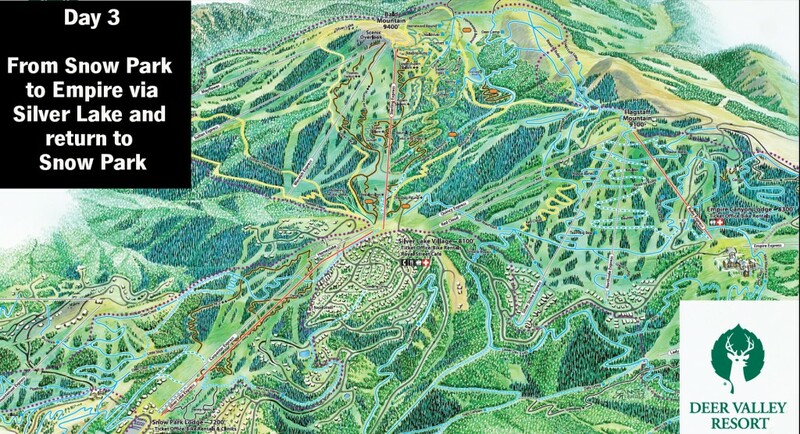 From there, ride the Ruby Express Chairlift down to the Empire Lodge. Once there, hike back to Silver Lake via the same Mid Mountain Trail. Upon reaching Silver Lake Village, give your legs another break and download the Silver Lake Express chairlift. Both chairlift rides are free, as there’s no charge for the downhill rides, only the uphill part. This hike is a half-day hike. Including the two chairlift rides, it takes an average person between three-and-a-half to four hours to complete the whole loop. This too can be a perfect morning hike but can also be done at any time during the day. “One of the advantages of hiking at Deer Valley Resort is that the lifts are open from 10 a.m. to 5 p.m. every day, and that there’s always a staff of professional patrollers available to help for any reason,” remarks Steve Graff. If the weather stays nice, as it does most of the time in the Wasatch Mountains, and no rain is on the forecast, a change of pace is always a wise idea around mid-week. Day four could be used for a guided hike. Deer Valley’s guided hikes are an excellent opportunity to learn what makes the area so unique, see more of nature and hike a little bit less. The resort has a number of guided hiking tours that can be customized to the needs and wants of all guests. They can be focused on local mining history, flora or wildlife. 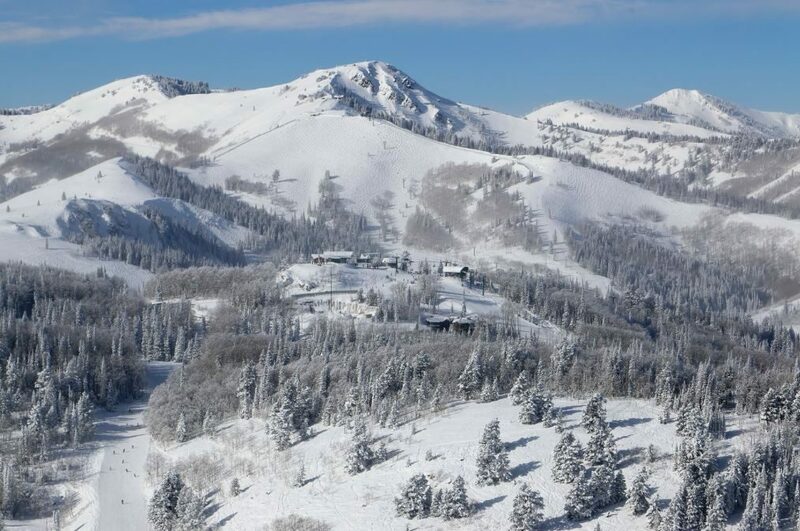 Some of the Deer Valley Guides have a vast knowledge of the local mountains and their surrounding areas. These tours should be booked in advance and can either accommodate small parties (up to five hikers) or larger groups (six to ten hikers), and are all reasonably priced. If you are looking for an even slower day, keep in mind that there is plenty of easy hiking waiting for you around Deer Valley and Park City without climbing a mountain. You can wander on the many trails that criss cross the valley floor, like the Poison Creek Trail, the Rail Trail, the Farm Trail or the more rugged Round Valley trail network, you can use the city-wide free bus system to combine them or when it’s time to return from your adventure. To crown a typical five-days hiking week, a special trip could take you from Silver Lake to Shadow Lake, a truly picturesque destination, right below Jupiter Peak in Park City Mountain Resort. 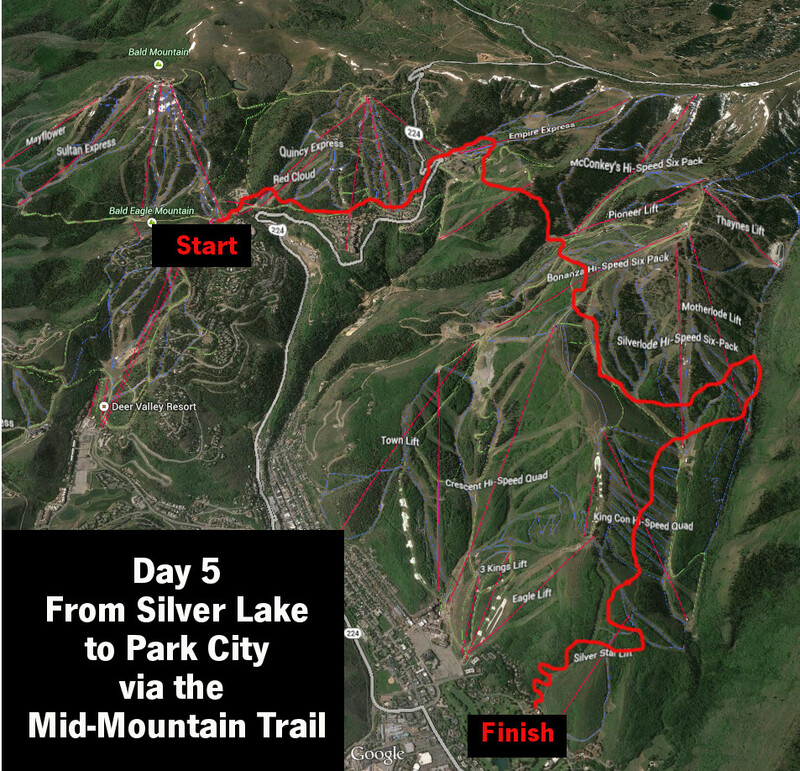 Another adventurous option is a long-distance hike on the Mid Mountain Trail, another multi-use trail, from Silver Lake Villate to Park City. This hike is a 7 to 8-mile trek, with little change in elevation but it will cover the whole distance that spans the two resorts. 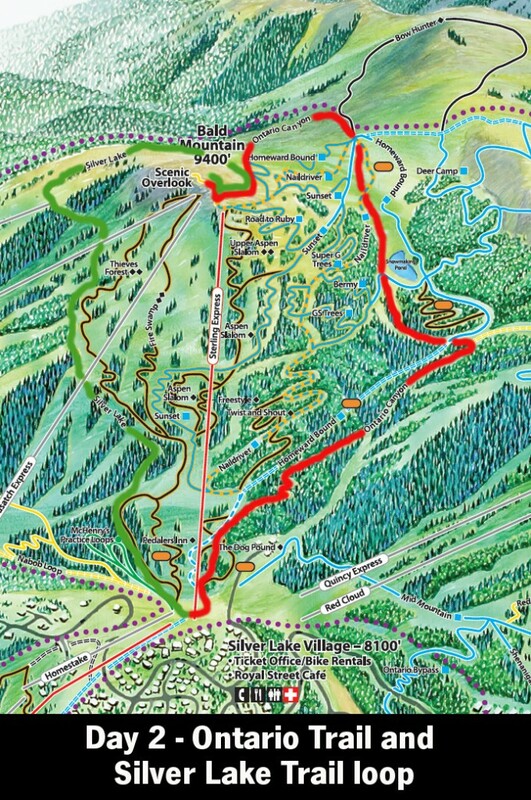 If you intend to embark on these longer hikes on your own, make sure you take along copies of the Deer Valley Resort summer trail map and the Mountain Trails Map, should you decide to push all the way to Park City Mountain Resort or even Canyons Resort. Steve stresses “In case of an accident, make sure to have the mountain patrol number on your cell phone (435-615-6208) and remember that you can call between 10 a.m. and 5 p.m. After these hours, dial 911 for any emergency.” With very few exceptions, cellular phone coverage is pretty good and is available from almost everywhere on the trails. You could either turn around on the Mid Mountain Trail, working it as an up and back, forge ahead to Canyons Resort if you feel unstoppable, or choose to go down the Spiro Trail to Park City. When you reach your destination, either take advantage of the Park City free bus system to get you back to your accommodations or have lunch or dinner in Park City. This option, that takes about two-and-a-half hours to complete and can be a great afternoon trek since most of the itinerary is well shaded. Now, it’s time to enjoy a week of happy trails in and around Deer Valley Resort.